Welcome to the CNS/NNCI User Info section of the CNS website. This section provides important and useful information for prospective, new, and current users of CNS facilities. The NNCI is a National Science Foundation program that consists of 14 institutions that together form a national network of facilities available for all academic users. For more general information regarding the NNCI program, please see the NNCI section of our website or go to the NNCI main web page at www.nnci.net. Since the core mission of the NNCI is to create an open national user facility network, CNS welcomes users from other academic and non-academic institutions to become Users of CNS facilities. All of our facilities/tools are considered part of the NNCI program. Enrollment in the CNS/NNCI User Program is required in order to use any tool, lab, or service provided by CNS. If you are interested in enrolling in the CNS/NNCI User Program, please proceed to the page How do I become a CNS/NNCI User? Please read through all of the pages in the User Info section of the CNS website as it contains important information regarding usage of CNS facilities. Within this section you will be able to see how to go about getting training within our two major specific facility areas once enrolled (Nanofabrication and Imaging and Analysis), how to properly acknowledge CNS and the NNCI for publications resulting from worked performed at or by CNS, all forms relating to usage, information on the user fees for use, as well as general information and policies relating to usage. All CNS Users must follow all applicable Harvard University policies. For more information, please see Harvard’s website: www.harvard.edu. Only fully enrolled, active Users who are qualified by CNS technical staff are allowed to use CNS equipment. Click here for instructions on how to enroll as a user. Users must be enrolled in the CNS User Program with an active status in order to use any facilities or tools at the Center for Nanoscale Systems. CNS Users are required to acknowledge the Center for Nanoscale Systems and the NSF’s National Nanotechnology Coordinated Infrastructure (NNCI) in any publications or presentations that result from work performed in whole or in part in the CNS facilities, or with assistance from CNS staff. Click the Citing the CNS tab to see the recommended language for CNS and NNCI publication acknowledgement. All publications, presentations, journal covers and patents resulting from the use of CNS facilities or through assistance from CNS staff must be reported to the CNS administrative office. Listing of publications, etc. may be entered via the CNS User Portal webpage. A reprint of the publication should also be delivered to the CNS Administrative Office, LISE 304. Any work done, or services provided, by CNS and its employees are on a reasonable effort basis. Users accept ultimate responsibility for the progress and results of their project. Users must operate CNS facilities and tools in a safe and professional manner, consistent with the operating instructions. CNS reserves the right to prohibit further use of facilities, if CNS, in its sole discretion, believes that a User is not properly trained or is working in an unsafe manner. Nanofabrication Facility Users must follow the Cleanroom User Protocol (CUP) regarding dress code, garment use/reuse/storage, handling materials and tools, transporting and handling chemicals, emergency response and evacuation, equipment sharing, maintenance and housekeeping. See the Nanofabrication Facility Use tab within this section for additional information regarding the CUP. Training and qualification for all CNS facilities and tools must be conducted by CNS staff. Training and qualification are both required in order to gain User Status for a particular facility or tool. Training consists solely of the observation of facility/tool operation. Qualification is the verification of training by CNS staff watching the User operate the facility or tool. Upon the completion of training and qualification, User privileges will be granted for that particular facility or tool. Please note that certain facilities/tools require that initial sessions by those with User privileges either be operator assisted or limited to normal business hours. The CNS staff member in charge of each tool has the final authority over granting User privileges, when any initial session requirements are met. If the facility or tool is on the CNS Online Scheduling Tool, advance time reservation is available for Users with User privileges (except in facilities that require initial assistance. In those instances, the CNS staff member must reserve the time). An advance reservation is recommended for facilities or tools that are listed on the CNS Scheduling Tool. Users are prohibited from scheduling time online for another user, even if they are members of the same research group or have the same affiliation. Only those with active User Status are allowed to schedule and use equipment. Users are permitted to only work on the projects that have been approved by CNS and listed in the system under that User profile. Additional projects require approval from CNS. An official qualification is required even if the person is a qualified user of a similar tool at another facility or institution. All Users are prohibited from giving out their Scheduling Tool User Name and/or Password for use by other users, or from giving other users access to their HUID or facilities access card for any card reader access controlled CNS facilities. CNS reserves the right to deny future access to any User in the event of a willful breach of this policy. Retraining and/or qualification may be required if a User has not used a specific facility for an extended period of time. It is the decision of CNS staff to determine the need for retraining and qualification. Users are required to enter in CLEAN all information requested and to properly log in and out of the instrumentation. Users are required to note any problems or irregularities with the facility or tool(s) operation during their session in CLEAN. This is to allow CNS staff to respond quickly to problems and keep issues from getting worse and causing more down time. Absolutely no food or drink should be brought into a CNS facility or consumed while using any CNS tool. Certain Imaging and Analysis facilities are located in building or rooms that require card reader access or iris scanner access. For Harvard Users, their HUID is used as access card, non-Harvard Users must visit the CNS Administrative Office at LISE 304 in order to obtain a swipe card. To physically enter any CNS lab space, a person must be a fully enrolled, active CNS User, who has been both trained and qualified by a CNS technical staff member on the instrument in that room and/or lab/facility that is to be entered. There are certain facilities that have special safety considerations (laser, x-ray etc.) and require special training and /or certification requirements. Please take a look at the specific tool webpage as well as the Nanofabrication facility Use and Imaging and Analysis Use tabs in this section for additional information on any special requirements for specific tools. CNS, in conjunction with Harvard Environmental Health & Safety, maintains a MSDS database. If you wish to bring any chemicals into a CNS lab space that is not listed on the MSDS database, you must complete a Material Request Form. CNS reserves the right to amend, abridge, alter, delete, add, or change any CNS policies as deemed necessary by CNS with or without any written notification. If you have any questions or concerns regarding Harvard or CNS policy, please feel free to send any questions to the CNS Administrative Office at info@cns.fas.harvard.edu. See the PDFs below for the current user fee rates for use of CNS facilities. Please note that there is a separate set of fees for Academic and Non-Academic Users. If you are unsure about whether you are considered an Academic or Non-Academic user by CNS, please contact us at nninapply@cns.fas.harvard.edu and let us know the details regarding your institution, including a web address. For questions regarding how CNS accounts for facility use for the purposes of billing, please see the tab in this section entitled Billing Policy. CNS facilities that are not listed (or are already included as part of one of the existing fees) on the user fee rate sheets are free of charge. Please note that the user fees are subject to periodic review and change. CNS reserves the right to change the user fees or add new tools to the user fee rate charts with or without written notice. However, CNS will not change rates effective for the current month once that month has started. Any change occurring during a month will take effect on the first day of the next month. Training: CNS bills for regularly scheduled training events at the On-Site Assisted rate only (the tool rate is not charged.) Also, the cost is divided among the available seats for a training event. For example, if there is a 2 hour training that has 4 seats available to attend, then each seat is responsible for .5 of an hour of On-Site Assisted staff time. Special requests for one-on-one training are charged as full On-Site Assisted use including the tool time. CNS does not charge for basic safety training events such as the LISE CNS Safety Training and the LISE Cleanroom Orientation. CNS current rates are listed under CNS User Fees in the above navigation bar. The purpose of this page is to describe the basic billing policies of CNS to promote a better understanding of how CNS calculates usage time for billing purposes. The policies listed here are incorporated into the user program and are applicable to all CNS users. Users should be aware of these policies and read this page before getting their training and project underway. Instruments billed by the hour: CNS counts facilities/tools that are billed hourly in increments no smaller than the half-hour. In other words, time is rounded up to the nearest half hour. The exception is the LISE Cleanroom, which is rounded up to the nearest full hour. Instruments billed by 15-minute increments: These instruments are rounded up to the nearest 15-minute increment. Facilities that charge a per day fee: These facilities use an actual calendar day as the basis for charges. A day is 12:01 am to 11:59 pm. If a User enters a per day fee facility from 6 – 10 am and then returns from 9 – 11 pm, they are charged for 1 day. If a User enters a per day facility at 11:58 pm steps out at midnight and returns at 12:01 am, they are charged for 2 days. Materials Charges: CNS charges materials costs for a small number of CNS instruments where CNS provides certain materials for the usage (such as masks etc.). Please consult the rate sheets for additional details. In addition, CNS reserves the right to bill materials charges for any pass through charges incurred by CNS for a specific user or project (i.e. shipping of samples to remote customer etc.). Training/Assisted Use: CNS bills for regularly scheduled training events at the On-Site Assisted rate only (the tool rate is not charged.) Also, the cost is divided among the available seats for a training event. For example, if there is a 2 hour training that has 4 seats available to attend, then each seat is responsible for .5 of an hour of On-Site Assisted staff time. Special requests for one-on-one training are charged as full On-Site Assisted use including the tool time. CNS does not charge for basic safety training events such as the LISE/CNS Safety Training and the LISE Cleanroom Orientation. It is considered On-Site Assisted Use if a CNS staff member either operates the equipment for you, is in attendance to observe you operate the instrument, or must remain nearby during your session to monitor operation. It is considered Remote Assisted Use if a CNS staff member does work for you on instrumentation or in CNS labs at the request of a User who is not on-site. CNS considers an instrument to be in use and billable if it is, or appears to be, in use and therefore unavailable to others. CNS bills for all reserved time. This includes all reservations that are longer than required and reservations that don’t match the actual use times. This policy compliments our policy of billing for all actual use even if not entered in our scheduling tool. So please plan carefully when reserving equipment. Example: If you reserve an instrument from 1pm – 4pm but then actually use it from 3pm – 6pm, you will be billed for 5 hours as the earliest start time is the reserved 1pm and the latest end time is the actual use 6pm. If a User does not show up for the time he/she reserved on a CNS facility or tool on the CNS Scheduling Tool, he/she WILL be charged for the time reserved. This no-show charge is not subject to the monthly cap. For instruments on the CLEAN interlock system: Users are required to log-in when starting to use the instrument and log-out when finished. It is the users’ responsibility to remember to log-out. If a user fails to log-out of the instrument, they are considered to still be using it and will continue to be billed until they, or another user, logs them out. New for 2017: Fee waivers will not be granted for forgetting to log-out events unless there is a verifiable technical malfunction of the CLEAN system or instrument. Process for obtaining waivers of fees: CNS has no desire to charge users for instances where an instrument malfunctions or is otherwise unusable due to no fault of the user. However, due to the large number of both users and instruments there are specific procedures in place to make certain that these instances are properly captured and reflected in the billing review process. If an instrument malfunctions (or is otherwise rendered unusable) during your usage, a user must complete a CNS User Fee Waiver Form (fillable PDF) within 3 business days of the incident in order for the billing for that time to be waived. The form can be given to either the technical staff member in charge of the instrument OR to the CNS Admin Office in LISE 304 for routing to the technical staff member. Alternatively, it can be emailed to infoATcns.fas.harvard.edu. Requests made outside of the 3-business day window will not be considered without extenuating circumstances. Once it is reviewed and signed off by both the technical staff member in charge of the instrument and a member of the CNS Billing Team, the charge will be removed. If either the technical staff or admin team decides to decline the request, the user will be notified via email along with the reason(s) for the request being denied. Important Notes Regarding Fee Waivers: Verbal or email requests to either the technical staff or the CNS admin office are not sufficient to get a fee waived. The request must be accompanied with the User Fee Waiver Form. An entry in the CLEAN system’s log or any other system stating that you did not use an instrument or declaring it malfunctioned is not considered an official request for fee waiver. The instrument logs are only read by the technical staff in order to better track an instruments performance over time and log entries are not read or considered for fee waivers or modifications by the Admin Office. Users are required to cancel reservations that they cannot use or no longer need in a timely manner. Many CNS instruments can be canceled up to the scheduled start time, but there are several instruments with cancelation deadlines up to several hours before the scheduled start time. Users are responsible for noting the scheduling parameters of instruments that are a part of their project. This information can be found in the scheduling area of the User Portal. Any reservations not cancelled will be considered no-show events and billed accordingly. Any instance where a cancelation deadline or the start time has passed, the only way a reservation will be canceled is if there are extenuating circumstances and an email is sent to info@cns.fas.harvard.edu describing the reasons. Please note that a sample not being ready in time does not count as an extenuating circumstance (unless due to a CNS instrument malfunction in a previous step). Users will be billed according to the account or purchase order number provided on their CNS User Program enrollment forms, unless a prior arrangement has been made with the CNS Administrative Office. The enrollment forms supercede any entry on the CNS Scheduling Tool. If Users need to change their billing information prior to the annual CNS User Program Renewal date (March 1st of every year), they must complete and submit a Change of Billing Code or Purchase Order No. Form (fillable PDF). This work was performed in part at the Center for Nanoscale Systems (CNS), a member of the National Nanotechnology Coordinated Infrastructure Network (NNCI), which is supported by the National Science Foundation under NSF award no. 1541959. CNS is part of Harvard University. For presentations and posters, just listing the Center for Nanoscale Systems (CNS) is necessary. However, if the NNCI and NSF can be included without causing space issues, that would be preferred. If you wish to use a CNS logo on your presentation or poster, please email us at info@cns.fas.harvard.edu. Simply state what the logo will be used on and how it will be used. All forms are fillable PDF documents. You can complete the forms on screen before printing them or you can print them and fill them out by hand. Instrumentation within the Nanofabrication Facility falls into two groups: Tools within the LISE Cleanroom and those not in the LISE Cleanroom. For Nanofabrication Facility tools that are not in the LISE Cleanroom: Training can commence immediately upon completion of enrollment as a CNS User provided they do not have a specifically assigned prerequisite. Any of the SPM instrumentation considered part of the Nanofabrication Facility requires the SPM Intro training prior to full qualification. This SPM Intro training can be found on our training sign-up page. For the Dicing Saw in LISE G06, the G06 Room Training is considered a prerequisite and can also be found on the training sign-up page. For any of the Nanofabrication Back-End tools located in LISE G27, no additional prerequisites are needed for training on those instruments and training can be directly signed up for anytime after CNS User enrollment. For Nanofabrication Facility tools that are located in the LISE Cleanroom: Due to the additional safety and protocol concerns involved in working in a cleanroom environment, the following steps 1- 5 must be completed to be a considered a qualified LISE Cleanroom User. One must first become a LISE Cleanroom User prior to training and use of any tools within the LISE cleanroom. Once the requirements below have been completed and verified by the CNS Administrative Office, a researcher will be granted entry to the LISE Cleanroom. Also at this time, a LISE Cleanroom User can use any tool located in the cleanroom that does not require additional training and qualification. See below for additional information. Please note that step 1 must be completed prior to completion of steps 3 – 7. The Center for Nanoscale Systems (CNS) is a node in the National Science Foundation funded National Nanotechnology Coordinated Infrastructure (NNCI). It is required that all users of any Nanofabrication Facility (NF) tool first be enrolled in the CNS User Program before any training or use of the NF facility. To enroll, please go to: How do I become a CNS User? If you have questions or concern regarding the enrollment process, please contact us at info@cns.fas.harvard.edu. This training consists of reviewing the CNS Safety Manual (which you already have read if you have completed Step 1 above), and a reading a presentation that instructs prospective users in basic rules of use of the LISE Cleanroom known as the Cleanroom User Protocol or CUP (see link directly below). Search the term: CNS in the search box at the Harvard Training Portal and you will be able to find the CUP quiz. Please note that you must have a Harvard Key in order to be able to access the Harvard Training Portal. For those already at Harvard you likely already have claimed your HU Key, so you can take this quiz at any time in the process even if your enrollment is not yet finalized. For Non-Harvard Users who do not have a Harvard Key, you will get one once your enrollment is completed. Please note that the quiz asks questions where the answers can reside from both the CUP document AND the CNS Safety Manual. In order to become qualified as a LISE Cleanroom User, attendance at a LISE Cleanroom Orientation is required. Please print out and bring a copy of the cleanroom orientation form to your scheduled orientation session. Users are responsible for printing out and bringing this form to the orientation! Pre-registration for the orientation is required and can be done at the CNS Training Sign-Up page. Trainings are normally held on Tuesday and Thursday. However, please check the training page, as the schedule is subject to change. Upon completion, the CNS Nanofabrication Facility staff member who conducted the orientation will sign the last page of the form. You will also need to sign it as well. Once signed, the form needs to be turned into the CNS Admin. Office (LISE 304). The meeting place for the Cleanroom Orientation is in front of the entrance to the LISE Cleanroom (G07). Upon verified completion of steps 1-4 by the CNS Admin Office, Users will be set-up for physical access to the LISE Cleanroom (G07). Your HUID or CNS access card will be given access to both the gowning room and main LISE Cleanroom via the swipe readers. If you wish to gain hands free access to the cleanroom, you will need to go to the CNS Admin Office (LISE 304) in order to get set-up in the iris reader system for this access. Once steps 1-5 are completed, you will be considered an official LISE Cleanroom User. Please see below for additional information on how to become trained on specific tools within the LISE Cleanroom. If your project involves any instrumentation within these areas, you should first take the Intro training prior to specific instrument training.. These intro training events serve to provide users with some basic information relating to the tools, processes, and protocols for instruments within that subarea, but also allow the staff to interact with you to determine which instrument(s) within that subarea are best suited to your specific needs. Please note that these Intro training events take place outside of the cleanroom, so you can sign-up for them even if you ultimately plan on using instruments within the cleanroom. To take the Intro training you must have at least completed step 1, but the other steps are not necessary. Please note that if any of the work you will do in the LISE cleanroom will involve use of the wet benches (or instrumentation that normally requires wet bench work even if you do not plan to use them), there is a special LISE wet bench training/qualification required. Users must preregister for this training and can do so at the CNS Training Sign-Up page. 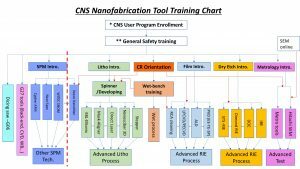 Please see the CNS Nanofabrication Tool Training Chart to see if this training is required as part of your project within the cleanroom. Once you are a fully enrolled CNS User, LISE Cleanroom User, and have taken any required Intro or prerequisite training(s), you are now ready to sign-up for specific instrument training. If the training for the instrument you are looking is listed on the CNS Training Sign-Up page, simply sign-up for the next available session. After completion of the above steps, you are considered a qualified user of that specific tool. Retraining may be necessary if a user hasn’t used the specific tool for a long period of time. Do not schedule time for others. You must conform to all rules and procedures regarding use of the specific tool including properly using the CLEAN system. Bringing in others from your group to “observe” is not allowed with out prior permission from the Nanofabrication Facility Manager. This will be strictly enforced. In order to receive training on one of the CNS Imaging and Analysis Facility instruments, you must first be enrolled as a CNS User. Please see the “Become a CNS User” tab at our website for more details regarding the User enrollment process. In order for CNS Users to get specific tool training, we use the CNS Training Sign-Up page for all of the more common, re-occurring training events. Most CNS training events are hands-on and take place within our labs. However, there are some initial training events that are done online through the centralized Harvard Training Portal. You will need a Harvard Key in order to access any online trainings at the portal. If you are a Non-Harvard User, you will get a HU Key upon completion of the enrollment process. If you are an existing Non-HU CNS User from before we issued HU Keys to external users, please email us at: info@cns.fas.harvard.edu to request one. We do recommend that you take a look through this page first before signing-up for trainings, as there may be prerequisite requirements for that instrument or lab area. This page is designed to help you navigate the training requirements within this facility area of CNS to assist you in putting together the best training pathway for your project. G05 Biomaterials Lab: Because this lab has multiple smaller instruments that each pose potential hazards, there is a specific CNS safety training require for this room entitled the, “LISE G05 Biomaterials Room Safety Orientation.” This training is held frequently and can be found on the training sign-up page. Because it is a lab that is designed for use with biological materials, one must also complete the Laboratory Biosafety course offered by the Harvard EH&S Department through the Harvard Training Portal. Once you have taken the online Laboratory Biosafety course, you should print out a copy of the completion certificate and complete a CNS Biological Safety Requirements Form, which can be found in the Forms tab in the User Info section of our website. The completed form and certificate should be given to Sandra Nakasone: snakasone@cns.fas.harvard.edu. She is the CNS staff member in charge of this lab. Once you have completed the above prerequisites, you will be granted access to the lab. There is an additional training required if you are intending to use the bio-hoods located within this lab. Please inform Sandra if your project will involve use of the bio-hoods. Special Note: If you are project will involve use of DelsaNano DLS System, you must also turn in a Nanoparticles Safety Requirement Form, which can be also found in the Forms tab of the User Info section. G06 Chemical Nanotechnology Lab: There is a specific room safety orientation that is required in order to use any instrumentation within this lab space, entitled the, “LISE G06 Room Safety Orientation.” In order to gain access to this space one must have that training AND a specific instrument within that lab. Soft Materials Clean Room (SMCR): Please note that this is considered a separate facility from the main LISE Cleanroom which is a part of the Nanofabrication Facility. This lab has a specific training. 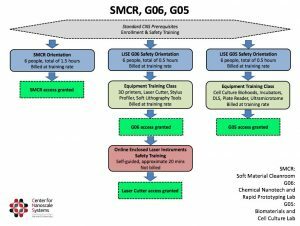 One does not need to go through the Nanofabrication Facility cleanroom qualification process in order to get training and access for the SMCR. 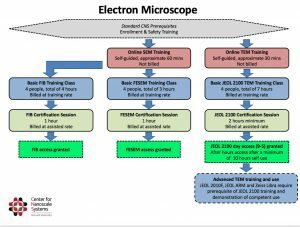 FESEM Training: Training on the scanning electron microscopes in the Imaging facility consists of three main steps once your CNS User enrollment is complete. The first of these steps include an online training at the Harvard Training Portal. Specific information regarding this training can be found at the CNS Training Sign-up Page. Once that is completed, you can sign-up for the FESEM Part 2 Training, which is conducted in one of the the SEM labs. You can sign-up at the above training sign-up page. Finally, you would arrange with the trainer of the part 2 event to schedule a one-on-one certification session to demonstrate proficiency. Once that is done, you will gain access. TEM Training: Training on the TEM systems is a similar process as with the SEMs, involving a part one training online at the Harvard Training Portal, an in-lab TEM Part 2 Training, and a one-on-one certification session in order to gain self-use access to our JEOL 2100 system. Additional training may be needed if your project requires one of the more advanced TEM instruments at CNS. Details if such training is required in your case will be provided during the certification session. FIB Training: Is a similar process to FESEM training. For information regarding the training pathway for this instrument, please click here. The resulting document will describe the training pathway for this instrument in detail. Please contact Carolyn Marks (cmarks@cns.fas.harvard.edu) for additional information regarding training for this instrument. The CNS Imaging group has multiple systems that fall under this category including a Micro-CT, multiple XPS and XRF instrumentation. All of these systems will have training events, conducted by CNS staff that can be signed up for at the CNS Training Sign-up Page. 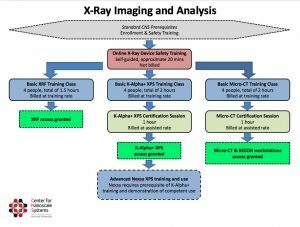 It is also required, prior to final certification and use that one take the X-Ray Device Safety online training at the Harvard Training Portal. The Imaging Sample Prep. Room, LISE B15A, has a prerequisite of a special safety orientation required in order to obtain access and training on specific instrumentation within this room. If you need training on instrumentation in this sample preparation room, you must complete the online B15A Safety Training, which is available from the Harvard Training Portal. Specific information regarding this training can be found at the CNS Training Sign-up Page. Sputter Coater Training: CNS handles the training for the sputter coater instruments that reside in the LISE B15A Sample Prep. Room via an online training at the Harvard Training Portal. Specific information regarding this training can be found at the CNS Training Sign-up Page. There may be additional prerequisite requirements for other instrumentation within this CNS Imaging and Analysis Group. Any additional requirements would be communicated during a formal training event. Most of the other major Imaging Group instrumentation training events are done via the training sign-up. If you do not see a particular training online, please contact the CNS staff member in charge of that facility/tool and arrange for training or assistance. To determine which staff member you should contact, please consult the Facilities section of the site. If you still cannot determine which staff member you should contact, please email info@cns.fas.harvard.edu.